Rainy start to the day. It rained heavily overnight and into the morning. On waking I hear both wind and rain buffeting the hut and rolled over to sleep in. The next section from Rintoul Hut passes over another exposed alpine peak and there was no way I was doing this in the rain. A lazy morning was had, resting, staying warm in the sleeping bag and eating food. Given that the hut directly overlooked Nelson I had full service on my ipad and was able to check the weather. The forecast and rain radar both indicating the rain was to break up around noon and there might be a chance to get half a days walking in. The forecast was spot on. Just before 12pm the cloud started to break up and the views out from the hut towards the coast returned and the rain had all but cleared. I had my gear packed and ready to go and hit the trail. From Rintoul Hut the trail ascended through similar beech forest that had been encountered in previous days, leading up to the treeline towards Purple Top. This exposed peak of 1400m I guess getting its name from the colour of the rocks on the surface. Many shades of purple, orange and red rock in loose shales forming an outcrop with very little growing. The route was marked with orange poles given there was nothing to affix the standard orange triangles to and with misty cloud coming and going over the top I’d have to look ahead at the next few markers to gauge the way before it disappeared into the cloud again. It didnt take long to get to the top. From there it was a matter of following the poles and walking over a large boulder field, no track to speak of. Down the other side and it was back into the tree line following along undulating ridges for a good 5 or 6 kilometres. The high ground offering up some nice views out towards the coast and looking back towards Mt Rintoul in the clearing weather. It was great to get a view of what I’d climbed down yesterday. Sitting proud on the horizon, Rintoul dominates the local area. I was making good time and arrived at Tarn Hut on 3pm, leaving more than enough time to push on to Mid Wairoa Hut. Two kilometres in and I hit a sidle trail that traversed around Bushy Top. These sections of trail are generally the worst sections to walk on, typically no more than a marked route, very few cut or benched sections and typically out-sloped to the max with steep drop offs. This one didn’t disappoint and was a similar standard to other sidles I’ve previously walked. Many TAers are referring to sidles as ‘suisidles’ given their reputation. I took a slip off one spot that was out sloped with nothing to grip but wet rock and tree rocks. My shoes shooting out from under me and barrelling be off the side. I slide for 2 metres, grazing knuckles and drawing blood on rock as my hand smashed into the ground to stop myself sliding any further. The sidle was only a kilometres long but just seemed to go on an on. Finally the sidle ended bringing me back onto the ridge proper and some nicer ground although still steep. The next 3.5 kilometres were all down hill towards Mid Wairoa Hut. Steep the whole way and my knees were not loving it. I was relishing every piece of flat ground there was, even if they were only 20 metres long. The hardest descent was just before the Wairoa River. At 45 degrees, it descended 400 metres in height over the same distance. Lucky for me it turns out there actually are some sections of trail with switchbacks in NZ and this was one of them. It wanted the turns in for sure, as to descent straight down would be fraught with mishaps on the loose gravel. At the bottom of the slope, there was a swing bridge over the Wairoa River and a dodgy exit off the bridge onto a rocky ledge leading to Mid Wairoa Hut. All in all, not a bad days walking given that I lost the morning due to rain. I reached the hut just before 6pm. Opening the door of the hut I was greeted by Anna from Germany and directed to the best swimming hole encountered on the trail so far. 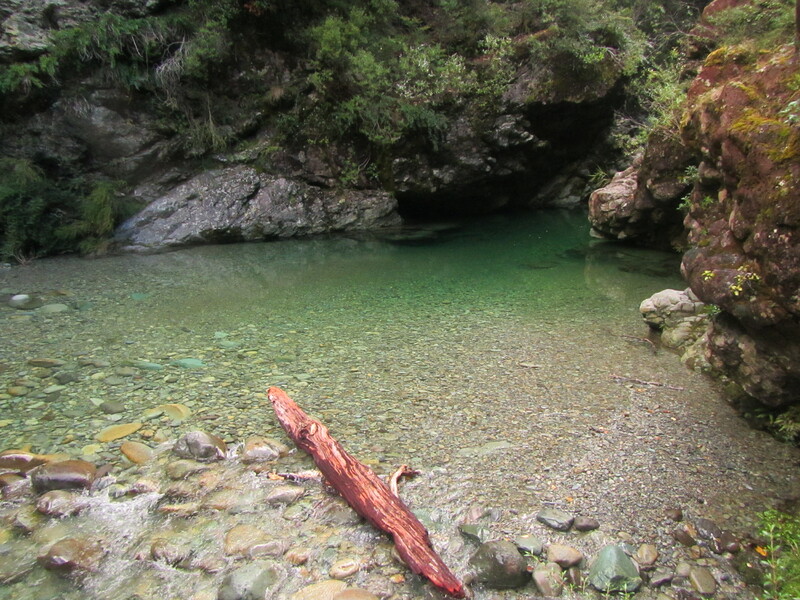 Just away from the hut, off a small trail and a quick rock scramble was the perfect swimming hole to cool down and wash the days grime away. A pool of crystal clear water being fed by a waterfall just up stream but out of view and over looking a smaller cascade just across the other side of the river. It was cold but not enough to stop me jumping in to cool down. A few minutes was enough before the cold and sandflies drew me back out. What a way to finish the day. Yes, you are a wise man making the decisions about when to stay put. Keep on keeping on and will see you soon.